Has it really been THREE years since my last mod? Apparently so! To get everyone up-to-speed on what's been going on -- Moved to California, met a girl, got married.  :) No longer can I throw "us" into the bottomless pits of debt to churn out some hair-brained mod of mine. Things have to be done in a more practical manner now! DialupPC has been re-allocated to the HTPC. It is also the PC that powers our new LCD Touchframe! To clarify -- this is ONLY an LCD mod. The computer isn't inside the LCD. Our new LCD Touchframe is used as the secondary monitor for DialupPC and shows photos from a network share. Cost of mod: $60 (LCD parts), $14 (picture frame), $8 (picture stand), $12 (maroon frame mat), spare cables + misc parts (free from my spare parts box). Total cost: only about $94.00! 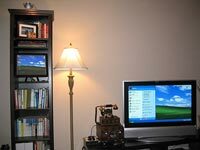 15" LCD Touchframe set in bookcase as the secondary display of our HTPC. Main LCD: 37" Vizio TV from Costco. has been idle for 1 minute. Slick! What it looked like before. 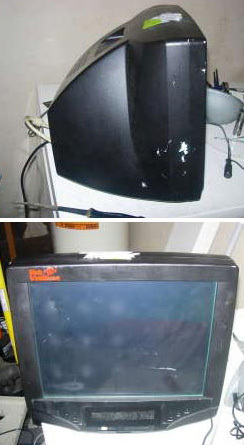 This was an all-in-one PC with an LCD touch screen. I think this was originally used on a bar counter as some sort of bingo game. It was running Win98 and on boot, was set to run fstBingo.exe from a net work share. 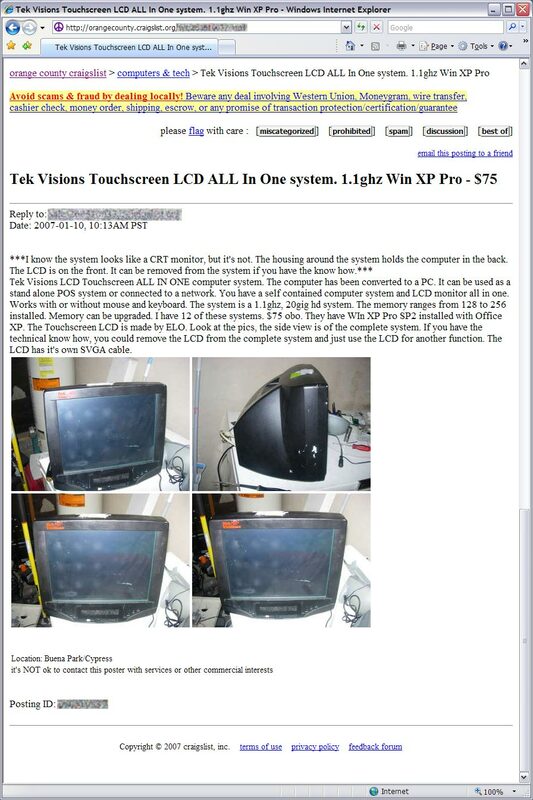 I didn't actually take this pic; it's from the original craigslist posting. Nothing's safe from me once I have my sights set on it!!! 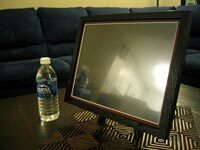 Close-up of the LCD Touchscreen part of the all-in-one PC. 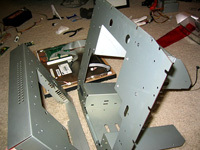 The motherboard and PSU mounts are riveted. Those required drilling out. 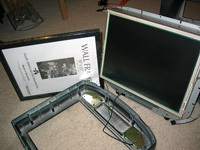 Also notice the metal back frame of the LCD is grey... that will be spray-painted black rustoleum. Measuring up the wooden 10x13" frame that will go around the touchscreen. I had to widen the inside of the frame to fit around the LCD. Grr! I wished things would just mod themselves sometimes. 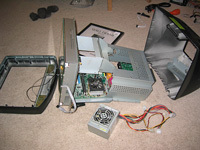 The LCD separated from its mount. 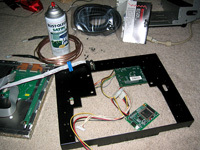 I still have to separate the LCD mount from the motherboard mount riveted to its back. Drilled out all 14(? lost count) rivets. Bye Bye all-in-one PC! 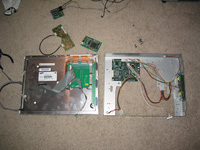 The LCD and its frame side by side. 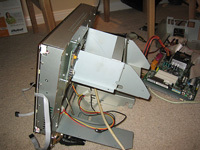 Notice the molex connectors. 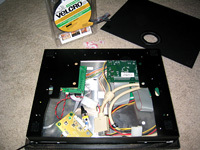 12V is for the LCD, 5V for the ELO touch controller. This will supply power to the LCD. 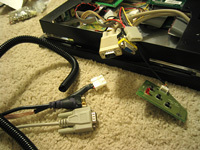 See the molex in the picture to the left? 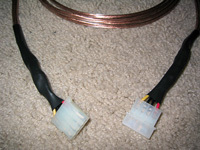 This is the extension cable I made using "lamp wire" from home depot. 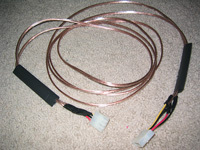 After doing Cyberpumpkin, making this molex extension was small potatoes compared to the ATX extension I had to make. 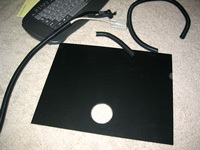 This is before the heatshrink sleeving is shrunk in place. Heatshrink all nice and fitted to the extension. Not bad eh? Too bad no one will see this. But I guess it's nice to know that a good job was done on the cabling.... or something. 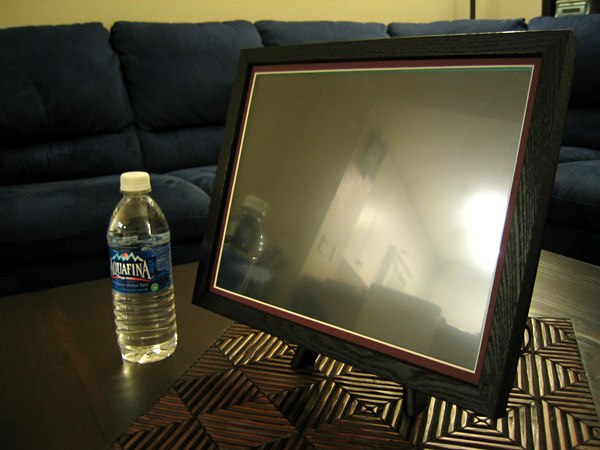 A few coats of rustoleum black satin and our LCD frame is lookin' good! What's this doing here? 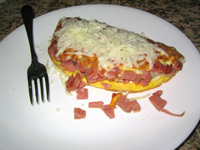 I need to show the world that not only can I mod, but I can also make a rice, Spam Lite and mozzarella cheese omelet for myself ... even when the missus is out of town. I was making this mod to surprise her when she came back. 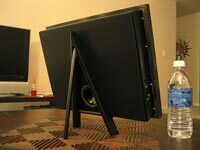 And yes... she likes it (the LCD touchframe, not the omelet, silly! -- I ate it already). 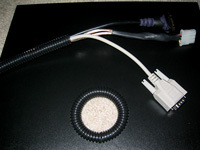 The extension cables to be plugged into the LCD touchframe. They'll be run through the black tubing to keep the cable run looking clean. LCD Touchscreen's new home. 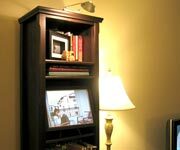 The bookshelf beside our TV. There were books here, but they'll be relocated to the lower shelf and other overflow to other bookshelves. 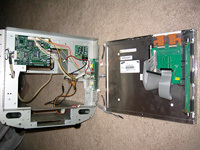 This is the back panel of the LCD. It's a piece of thick black cardboard from the local crafts shop. At $1.99, the price was right! 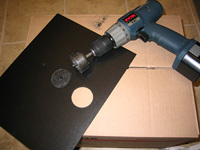 Oh yeah, "people don't buy drills, they buy holes." You can see the wrapped cable extensions. With the extra leftover cable wrap, I decided to "finish" the hole I bought (see comment to the left about buying holes). VELCRO - if it's good enough for NASA, it's good enough for me! 4 squares of Velcro - one in each corner - is enough to keep on the back panel. Phew, that hole drill bit attachment was getting a workout. 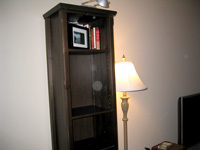 This hole was drilled in our bookshelf for the wires to be run in from the back.